Amid a warming planet, snow falls in Southern Morocco – first time in 50 years | Watts Up With That? 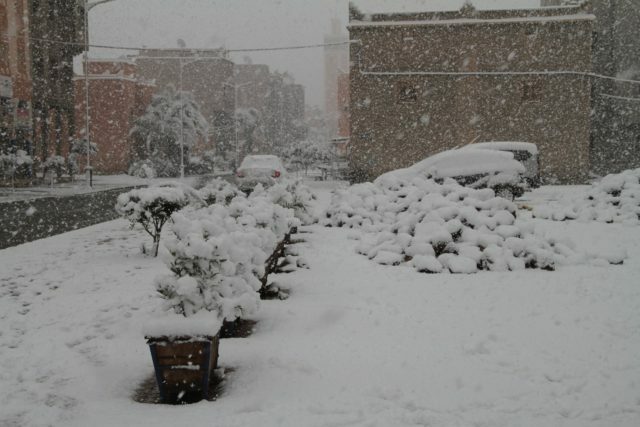 He also added that these drops in temperature accompanied by rainfall and snowfall in several parts of Morocco are expected to continue until next Thursday. New weather alert released by the National Directorate of Meteorology on Monday forecasts temperatures ranging between -04 and 1°C and maximum of 5 to 9 °C in Ouarzazate. These heavy snowfalls made travel absolutely impossible as the roads were blocked. There will be also delays in air traffic. A video posted on social media shows a man from Tinzouline, a town 15 kilometres from Zagora expressing his joy over the snowing atmosphere. January 31, 2018 in snowfall. That is highly plausible given some of the other theories doing the rounds. Talk about a ‘Tipping Point” Al Gore. Gore has to be there somewhere, only reason it would snow. Where Gore goes, Gaia follows. It was clear that the Ghost of Al Gore would appear within the few first comments of this post. Maybe Afonse Gore meant to say the “Tipper Point,” referring to their divorce? That at least matches observed data and doesn’t make him look like such willfully incorrect eejit. Nah, don’t you recognize global warming when you see it:) You see snow is hot and hot weather is hotter. Didn’t you ever read Orwells 1984? It did, but it is the other way around. More CO2 means higher atmospheric pressure and higher atmospheric pressure means lower melting point and higher boiling point of H2O. Does it matter? Not at all. The change is unmeasurable. Pretty much like the effect of the melting and refreezing of the Arctic ice cap on sea level. It’s true that Global Warming causes freezing weather because it’s not climate, only weather. So I’m told. Okay, ONE snowstorm doesn’t prove it’s cooling, but we must be up to several dozen over the past 5 years or thereabout. Really, people, it is getting colder, no matter what the “physics” says or where the trendline goes. Is it a good ideas to ignore science and just rely on gut instinct? The places it is warmer, what should those people rely on? Well, from what I’ve heard, zazove, the places getting appreciably warmer of late are near the poles for the most part . . so “they” oughtn’t need to “rely on” much of anything . . new anyway ; ) All “climate change can’t be bad by default, it seems to me . . The left half of our brain is articulate and logical. The right half is inarticulate but is responsible for putting the processing of the left half in context. IMHO, it’s where gut feelings originate. Our education system privileges analysis at the expense of knowledge. It denigrates things like gut feelings. The result is the flowering of postmodern BS. A well adjusted sane individual will have a good balance between the brain’s hemispheres. Gut feelings and logic are both necessary. Folks who fall away from that balance become disfunctional. Some things do take analysis. Then there’s decision-making. The concept of a “gut instinct” or “gut reaction” is well established, but in fact those fluttery sensations start with signals coming from the brain – the fight or flight response again. The resulting feeling of anxiety or excitement may affect your decision about whether to do that bungee jump or arrange a second date, but the idea that your second brain has directed the choice is not warranted. Deciding that a theory conflicts with one’s lived experience is done in the right hemisphere of the brain. That decision may promote a physiological reaction. The problem is that the temperature records are being adjusted every now and then. And there are several datasets, so nobody really knows how much does the planet has warmed, or cooled. zazove—Yes, it is correct to ignore science when evidence indicates the theory is flawed, whether or not your gut agrees. As for people who live where it’s warmer, assuming they have cell phones and the net (93% of Africa does, you know), they can rely on the observations of others, just as I have. One supposes I could be foolish and assume that there is no snow in Morocco, it’s just the fossil fuel industry lying to us, but I really can’t go down the road to the nihilist end. zazove: The Weather Channel shows a low of -44F in Omolon. NOT the -88F in Oymyakon. So the temperature rose approximately 83F, NOT 126F. Your source is deliberately misrepresenting the situation to make it look like more warming occured than usual. So, you are using a source that is willing to mislead. Ever wonder why people don’t believe the global warming folks? You’re looking at it. There has been snow in many of these places over the past 5 years. Seems like every time there is, it’s the first snow in 50 years. 50 years is the new 97%. As I stated, and you ignored, I said one event does not count, but all these “first snow in 50 years” cannot be ignored. The average GAT should be decreasing at least a bit, with all these cold records. If it’s not, I have a problem with the entire process. If I’m looking at widespread cold and someone says it’s hotter, my BS meter goes off. Hear that dinging in the background? Urederra sums it up well. Climate scientists are very quick, too quick, to adjust data that previous studies in climate science were based upon when they don’t like the results. When this happens they ought to go back and reassess/disown previous results, but they don’t. This ought to trouble people in the field greatly, but it apparently doesn’t give them any sleepless nights. This is why I assume almost everything in the field is now almost worthless. The field should have it’s funding cut by >95%. It is not science. Whose wouldn’t? But what data are you relying on? Or are you relying on gut instinct going on what you’ve personally experienced? If not, can you show me a map of the “widespread cold”? and I don’t mean: ‘Normal’ NH winter type cold, I mean unusual cold. Also, I don’t mean brief, localised extremes. I mean persistent, widespread and globally significant? Nor can a higher GAT. Higher, meaning that the warm anomalies are even more significant than the cool. But you choose the less significant. Why? zazove: I can’t show a map at the moment, but I’ll see what I can come up with. A higher GAT can and should be ignored if there is widespread cooling and the GAT is increasing. In science, that would be a “clue” that the data or theory has a problem. One should investigate thoroughly before accepting either the GAT or the theory. If. I see no evidence of widespread cooling. Climate scientists don’t adjust data because people get results they don’t like. That’s pure erroneous assertion. There must always be a legitimate reason to do so, and tests of why it’s legit (comparisons with other data sets, for example so that they are comparable – two sets may show exactly the same patterns but be offset by a consistent amount). Besides, it would create utter havoc in publishing and citing research. Indeed. Like noting that Siberia is a rather big place. And that the two places WaPo compares to get that “126 degree rise” are about as far apart as Chicago and Atlanta. I believe it was Algeria that had snow a month ago. The dunes in snow was all over online. I wonder if there isn’t, in fact, a continuing warming trend. When the world was warmer, the Sahara was green. For that to happen again there would need to be a change in patterns of precipitation. Could these be very early harbingers of things to come? I’m doubtful Libya and Egypt would object to more green acreage. Warmer is better. Nope. When Sahara was green it was because the summer monsoon came further north, not that the mediterranean winter came further south. The writing is on the wall – Mene, mene, tekel, ufarsim……. The weather is pretty consistent with the current weather patterns the US is experiencing- a convoluted jetstream slowly moving west to east(stadium wave?). Each spike in the wave is about 3,000 mi. wide and takes ~12 weeks, peak to peak to cross the US. In between the jet stream is more directly east/west and the weather is warmer. The average temperature along the path may or may not vary much, but the weather sure does. Apparently the phenomenon has occurred repeatedly in the past, but it took meteorologist and a few climate scientists awhile to catch what was happening and look at the right records in the right sequence to understand what appears to be going on. Weather. Not climate. The repetition of weather = climate. If it happened before it’s probably weather. What’s so hard about that to understand? Oh, hang on a . . . . .
You got any “climate” that hasn’t happened before to prove climate change? I imagine it is Al Gore and his alarmists who are fellow members of his ReligiouScience that have confused the masses as they continually point to weather events as signs of Global Warming. Climate change is real and has been occurring since the earth’s inception, but man can do little to impact or stop it…that’s the folly in it all. That’s all fine and dandy, but next time there’s a heatwave somewhere, please don’t try using it as evidence of CAGW. The problem is lack of consistency – weather is always climate when it suits the CAGW narrative. Climate=average WEATHER. See. Climate=average WEATHER. You can’t have climate without weather. You can observe changes in weather over a long period of time and deduce climate. You do NOT need a supercomputer and government grants to figure out average weather, unless the goal is to terrify the population into believing living in a cave is the only way to avoid some catastrophe seen in a computer crystal ball. What’s so hard to understand about that? Climate is an abstraction ABOUT the weather. It all goes back to weather, no matter what someone calls it to vainly attempt to make themselves look smart. Andrew: I totally agree. No one lives in “climate”, they live in weather. However, the global warming believers seem to think that saying “It’s weather, not climate” makes them look brilliant and the commenter foolish. They do not understand that climate has no substance or reality. It’s a mathematical calculation. If we defined it as the mode or the median weather/temperature, the answer probably would be different. The only significance is the “gut feeling” that is rejected. If the climate is “warm”, one thinks Florida. If it’s “cold”, think Canada. It’s a ballpark. That’s it. My husband had a coworker who moved to Wyoming and people told him the summers are cool, it hardly ever gets over 90F. It was over 90F for a month that year. Averages and trends mean very little in the real world. Caused by the same Queensland coal miners who flooded the Seine and killed all the polar bears on the barrier reef and changed the gender balance of the mock turtles. I hope the enjoy the weather, as it really is the only weather presently available in their locale. NASA has been warning of the poles flip-flopping. Right now the North Pole is located right over Morocco. This really is a so what story. People here complain when there are stories about record highs, how is this different? It’s long term trends that count. This story means literally nothing. Are you saying it’s a nothing burger? Figuratively, to you, it may meaning nothing. Literally, to many people, it is very interesting, especially to the folks that have never been in snow. I, and others I know, always enjoy seeing these sorts of episodes. They remind us of how dynamic Earth’s processes are and how well, or not, such things are understood. One of the things that makes WUWT such a great site is the posts of this sort that celebrate our fantastic planet. Simon, I’m sure you would have pointed out to David Viner in 2000 that he should have made an exception for South Morocco. The most obvious long term trend that i can see is that certain people keep trying to rewrite his statement. Long term trend: More and more places with “the first snow in 50 years”. Yep, that’s the trend. That’s the difference. Nobody here is going to make the call that children just aren’t going to know what a T-shirt is. Iran got a big dump too. Down as far as Isfahan and Yazd. And it was very cold. But Iran often gets cold – bone-chillingly cold – in winter. – so that is weather, really. George C. Scott as “Patton” in N. Africa. ….But, but the children aren’t going to know what sand dunes are!! I just happened to be working with my database of NOAA GSN temperature records when I read this article, so I looked to see if I had anything close to the area, and it turned out I had the Ouarzazate station data, and it was a GSN station (ID MO000060265). I ran an SQL query against my database to get the 1981-2010 baseline monthly averages, using the TMAX temperature. Averages are bad things, so I use the TMAX to see just how warm things are getting. Still, you need those baseline monthly averages to get the anomalies. Here’s the results of my query, which I validated by querying for all the Jan dates from 1981-2010 and averaging those. The numbers matched up. Below are the baseline monthly averages, along with the standard deviations for each month’s data. It’s not the greatest record, but it does show very clearly that there’s been no great increase in TMAX, and in fact it’s more of a sinusoid throughout its length. If you take just the past 18 years, from Sept 2000 on, the trendline is flat as a board; however, I wouldn’t want to be accused of cherry picking and insinuating that 18 years with no TMAX increase is meaningful. I know this is only one data point, and I’ve got a long way to go. However, if the global average can be significantly changed by only 6% of the data points moving up a half-degree, what does that say to the people who claim that excessively warm or cold weather in the US has no effect because the US is only 3% of the Earth’s surface. That may be true, but the US has 1921 of the 7280 stations used in the GHCN v3 Monthly report, which works out to a whopping 26% of all the stations. Only a little over a quarter of the US stations has to increase in temp to have the effect shown in my experiment of last night. I’ll keep plugging away at the station data I have, and maybe when I’m done Anthony will let me present it all in a post, assuming what I’m doing has any meaning at all. Stick at it james. I have been toying with a similar idea. If there are two stations, 100 miles apart, infilling will tell us(in theory) what the temperature is in between. But if we have a station in between , how does its measurements compare to the infilling calculation? And why isnt this front and centre of the proof that the infilling works? I believe this testing has been done to some extent, but I don’t believe it has been done to anywhere near enough to justify what is done – nor that if you did it, you would be able to produce an algorithm that could reliably reproduce the temperature. There is simply too much variation. Even if it did work fairly well, there’s no guarantee that it would always work so well — and interpolated points between two stations is not data, and should never be used as such. There’s 7280 stations in the NOAA GHCN v3 Monthly report — isn’t that enough to get some kind of average anomaly without generating fake data? I am 10 miles from an official weather station and my cheap backyard station (in the pasture 100yds from the house) tracks the daily highs from that station pretty closely (it varies +/- 1 degree F), but the night time lows on my station tend to be 3 to 10 degrees F colder. An infilled average over my coordinates would be on average about 5 degrees F too hot. I’ll bet that can be replicated just about everywhere in the country where there is a rural area outside a built up area. I wonder about this too. Temperatures vary wildly even over a small area. I can’t see any way estimating can be accurate, other than by chance it hits the correct value. Yet estimates are an integral part of the “settled science”. THAT is just the kind of comment (with all the work beforehand) for which I love WUWT. 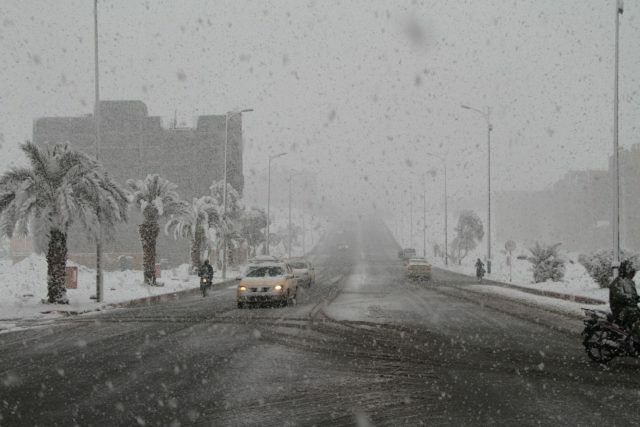 More snow for southern Morocco. Earth.nullschool 3-hour precipitation accumulation 08Feb2018 0000Z (the green ring is the location of Ouarzazate). Sounds to me with weather like this we must be headed for another record warm year in 2018 ( after adjustments). Snow in southern Morocco – difficult to imagine, considering how hot it gets in the summer – probably as hot as Hell. Thanks for that, Leo. You’re quoting a quatrain by Omar Khayyam of course. The first translator, Fitzgerald, did a fine job but took some liberties. Other translations of this quatrain, whilst similar, can help the reader get closer and closer to Khayyam’s original meaning. I recall that the ‘finger’ was cribbed by Fitz from the bible, not from OK. OK? I’ll shut up now. yup. LOADS of argument about the Rubaiyat, who wrote it and whether the translations are accurate, but what the heck,…. This goes to show that the warmers are right. With the earth warming the extremes increase so much colder here, much warmer there. I myself experience this effect every day when boiling the spuds. The warmer the contents, the colder the handles get. In the end I have to use my LOX gloves to lift the pan, so cold have the extremeties become. But it is a weather phenomenon. A combination of weak polar vortex, meandering Jet Stream, and a mass of cold air in altitude that breaks from the Jet Stream and moves South. The phenomenon is not very common, so going over a certain Southern area happens every many years. And regardless of global warming, winter Arctic air is always cold enough to produce snow no matter how far South it reaches. The closer we come to the PDO, AMO and NAO all being their respective 30-year cool cycles (early 2020’s), and the start of a 50~70 year Grand Solar Minimum event from 2020, the more common such “rare” cold events will become. I’m delighted these natural global cooling phenomena will soon disconfirm the absurd CAGW hypothesis, however, the coming global cooling will likely have many negative impacts, perhaps even devasting effects. Japan is also suffering from its coldest winter in 48 years, making my daily 30K cycling runs a bit chilly.. it’ll be interesting to see what winters are like 5 years from now. Thank you Samurai for your post. I have not fully studied climate during the Little Ice Ace, but I share your impression that wilder weather was more common during cold periods. If, as I believe, we are entering into another cold period starting soon, then I think we will see more extreme storms, and we will look back with fondness at this brief moderate natural warming period in Earth’s history. Will the global warming extremists shift seamlessly into this new cold reality, or will society remember their global warming alarmist nonsense, which wasted trillions of dollars and millions of lives, by denying cheap, abundant, reliable energy to the poorest among us? only 7ºC in Canberra overnight.. and that is in an Aussie summer !! Pretty cool here in Sydney last nigh too. And yet, only just over a week ago it was the hottest heatwave evah! Mind you at over 95% humidity, it was pretty nasty for me. Thank crunchie for aircon. Hard to believe, but Marocco has 7 listed ski resorts, on the peaks which rise to 3,200m (10,700ft). Nothing like Colorado, but they do have semi-regular ski seasons. Whats important about this news is that there hasnt been significant snowfall (and accumulation) in these towns (Ouarzazate, Taroudant, Zagora) for 50 years. That is a significant outlier. Nah… This couldn’t be “Snow”… surely it’s just really cold sand. It’s just a Sand Storm…. Climate “Scientists” told us that it would “never snow again”…. Why are the guys in that video laughing? Don’t they know that global warming is causing all that snow, and it’s the end of everything?!? Just because temperatures are rising doesn’t mean the world isn’t cooling. As the earth decends into the next glacial cycle we can expect more extreme storms, colder colds and hotter hots as the Climate becomes more unstable. In ten years, the snow won’t melt in Toronto during the summers. Snarcasm aside, we certainly could be in the beginning stages of a decades-long period of cooling, but it could take as much as a decade to be fully recognized, especially by those with Warmist blinders on. As Tamino (Grant Foster) and Hansen et al. recently pointed out, the enormous heat surge in 2016 could give those inclined to do so ample opportunity to claim in the coming years that another ‘pause’, or even ‘cooling’ has begun – this time starting 2016. Tamino did quite a simple but clever analysis. He extended the current observed warming trend in the annual data, since 1970, outwards to 2050. Ignoring natural variability and just assuming that each year would simply follow trend (+0.02/yr) he found that trend alone doesn’t surpass the 2016 annual record until 2027! Adding randomised natural variability he found a high probability (73%) that the 2016 record would not be beaten for at least another 8 years. We’d to wait 9-10 years before the probability that the 2016 record would be broken became more likely that not. In 1982 I drove with my ten year-old son from Fez to Marrakesh but got lost, big time, and ended up in Ouarzazate … it was a harrowing night of mountain driving, so I am surprised to learn it doesn’t snow there. Try again with the aiming at Paris and London. They need it most. We need to know much more of our past and where we come from to know our future. We really have our priorities wrong. Snow in southern Morocco yesterday, snow in northern Florida last month, several subzero outbreaks east of the Rockies, all reminders that winter weather outside the tropics can be highly unpredictable. Yet here in Salt Lake City, home of the “Greatest Snow on Earth” if Utah license plates are to be believed, January was unusually mild, with 27 days having high temperatures above 40 F (+4.5 C), and 13 days with high temperatures above 50 F (+10 C). We did have two snowstorms during the four days with highs below 40 F, but most of it melted within a few days. Good thing we don’t have the Winter Olympics here this year–there wouldn’t be much to ski on. There have been other winters which have been mild in the east and brutally cold in the west, but since the east coast is more heavily populated, the global-warming scare-mongers jump on any mild winter weather there to warn us that Greenland’s ice cap will suddenly melt and flood coastal cities, while ignoring April blizzards in Colorado. But if the populated areas are unusually cold and snowy, the global-warming scare-mongers go into hibernation and wait for Punxsutawney Phil to see his shadow. The truth is, the mass of air over the area within the Arctic Circle doesn’t vary much. If a polar air mass pushes south somewhere, it has to be replaced by air pushing north from the tropics over some other longitude. Wherever the polar air mass pushes south will have unusually cold winter weather, and some other area where tropical air is drawn northward will have unusually mild weather. When winter temperatures can rise or fall by 20 C or more within a day or a week, why should anyone worry about whether the “average” temperature (whatever that is) rises by 1 C in a century? So, whoever is under a mild air mass shouldn’t complain about global warming, but enjoy driving to work on dry roads and not having to shovel snow. Snow in Johannesburg in 2006. Snow in The Atacama Desert in Chile in 2006, and 2011, 2013, 2017 – driest place on Earth, no snow in living memory until 2006. Snow in Kuwait January 2016, first time EVER. Snap out of it, people. Things are changing right under Algore’s nose and he still thinks he can run that scam of his. Is anyone archiving pictures of these events, by any chance? And of course we nor the children were never to see ice by now, let alone in Africa. Go home Simon and co, you get old quickly. Actual weather has nothing to do with climate. Think of it this way: weather is a single voter. Climate Science is knowing that Hilary is going to win. There is a delightful implication that when it warms, it warms uniformly, so odd occurrences cannot occur. Anyone who has been regularly in the outdoors rather than cooped up blogging or modelling knows that is nonsense. Snow occurs in Morocco when the Azores High temporarily disappears. Jet stream anomalies etc. Record snow occurs in the Upper Rhone valley on SW winds, which brings Foehn to northern Swiss alpine valleys. January 2018 saw record warmth in Geneva and extremely heavy snowfall in the Swiss Alps. Meteo Schweiz if you will not believe me…..Ice Age, Ice Age was not being chanted at Cointrin airport…..the flowers were blooming instead. The world is not identical to NE USA, which had a cold snap. California is having a dry winter. UK is having an average one. No Beast from the East in London 2018….Genghis Khan is long dead….